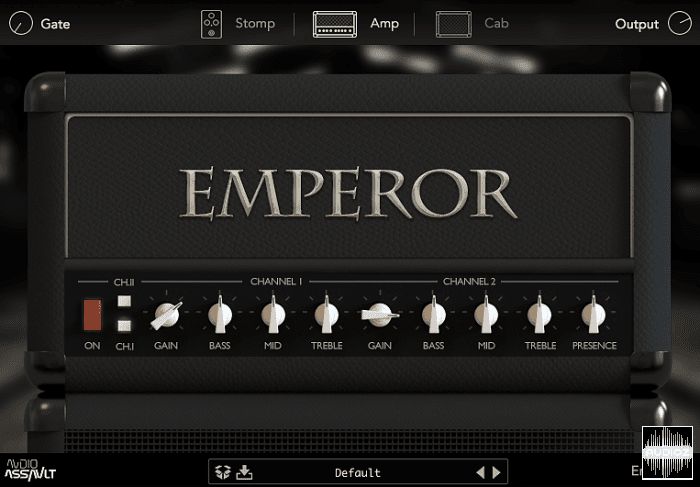 Emperor is part of our amplifier series, each of which brings a full guitar rig into one easy to use plugin! Emperor is inspired by a proprietary blend of modern metal legends, with a brightness and chunk that can cut through the heaviest mixes. 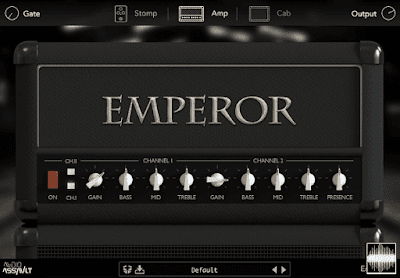 Combined with a flexible pedal board and effects loop, as well as our Virtual Cabinet with optional IR loader, Emperor makes it easy to craft the perfect tone quickly! Emperor uses an intuitive layout that mimics the familiar setup of most guitar rigs, making it a breeze to use at all skill levels! The top panel features a noise gate to reduce noise problems, as well as the Stomp, Amp, and Cab sections, followed by a linear output control. The heart and soul of Emperor is a two channel high gain monster! Emperor defaults to Channel 1, which features parameters for Gain, Bass, Mid, and Treble. Channel 2 features parameters for Gain, Bass, Mid, Treble, and Presence. Both channels clean up quite well at low gain settings, but neither will go fully clean. This allows for a versatile palate of tones, from crunchy rhythm to djent. If you want lush clean tones, Emperor isn’t for you. Included “ON” switch allows you to bypass the Emperor amp head, allowing you to just use the Stomp or Cab sections if desired. Each parameter in the Amp section can be automated, allowing for customization and flexibility! The Stomp section features 5 pedal slots, allowing you to choose between any combination of Emperor’s 10 included guitar pedals. Optional FX Loop allows you to place any pedal in the effects loop of Emperor’s amp head, allowing the pedal to process the output signal of Emperor instead of the input signal. Each pedal in the Stomp section can be automated, allowing for customization and flexibility! Boost: Adds a treble boost to the signal, controllable with one single knob! Screamer: Based on a legendary green overdrive pedal, Screamer can be used as a clean treble boost or to add overdrive! Compressor: A 4 parameter compressor designed to add sustain and attack to the incoming signal, or to manage the dynamics of the output when placed in the FX Loop. Distortion: A two parameter distortion unit that takes you from mild overdrive to nasty fuzzy metal tones! Chorus: A modulation monster that takes you anywhere from Classic Rock to Nu Metal and everywhere in between! The included mix knob allows you to fine tune just the right amount of the effect! Tremolo: Not just for surf rock anymore, this Tremolo pedal will add movement and contrast to your tone! Doubler: Not just a slight delay, this doubler splits the signal in two and changes the shape of one of them to create a convincing double tracked effect! Delay: A flexible delay unit that is capable of adding depth and space to your tone! Reverb: A sinfully simple, yet flexible reverb unit that is great for emulating small spaces or infinite drones! Auto-Wah: A Wah pedal with character! Using the Sensitivity control to switch between Auto and Manual modes, and the resonance control to choose how strong the Wah effect will be! Rocking the pedal back and forth will change the pivot point in Auto mode, and will allow you to manually perform the Wah pedal using your mouse or a midi controller! The Cab section utilizes our virtual cab technology to deliver the feel and microdynamic movements of a real speaker in a real room! The virtual cabinet section features a virtual microphone that you can move to find the sweet spot and perfect your tone, and allows you to choose from 4 microphone and cabinet models! The included HP and LP filters help shape the output to fit perfectly in your mix. Use the Distance control to adjust the proximity of the microphone to the cabinet. The Cabinet menu also allows you to access Emperor’s built in IR loader, allowing you to use your own IR collection within Emperor! Dynamic 57: Based on that famous workhorse microphone! You know the one! Condensor T1: Based on a legendary Large Diaphragm condenser, this mic delivers a present midrange bite! Ribbon 121: Based on a classic dynamic ribbon mic, this mic is well known for keeping harsh upper mids at bay! Dynamic 421: Based on another studio workhorse, the 421 delivers a midrange bite without being too harsh in the upper mids! British 4×12: Based on a legend that helped define rock and metal! American 2×12: Based on a series of legendary combo amps from a name that started Rock & Roll. Japanese 2×12: Based on a popular Japanese line of cabinets that deliver a big bottom end! German 4×12: Based on a legendary German cab beloved in Rock & Metal for it’s midrange presence! Selecting “IR Cabinet” will change the Mic selector to an IR selector, allowing you to choose between 14 included custom cabinet IR’s. “IR Cabinet” bypasses the virtual cabinet. The folder icon to the right allows you access to the folder where the included IR’s are located, allowing you to add your own IR collection to the directory folder for use in Dominator. Dominator is available in VST,VST3,AU,AAX & RTAS plug-in formats for both Mac & Windows.